Speedway Racing New Zealand for all things speedway including racing events calendar, driver profiles, crashes, pictures, videos, tracks, speedway ads, and more. 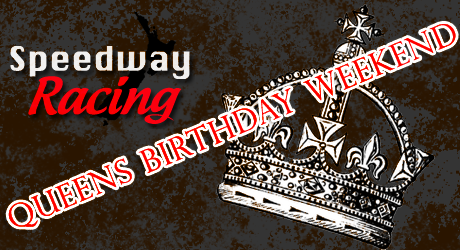 Looking for some speedway action this long weekend for Queen’s Birthday Weekend? Plenty happening at tracks around the country (depending on weather) for Queen’s Birthday Weekend. See below for more. Classes Running: saloon cars, stock cars, production saloons and mini stocks in action. The regular dirt track classes – which race clockwise – at the Waihi track will also be in attendance. Where: Mercury Bay Speedway, Track by the Whitianga airfield. Classes Running: Saloons, Super Saloons, Production Saloons & Ministocks. Also Ladies, Crew and Sponsor Races. Classes Running: A wide range of classes on offer. What: Awards Night for Manawatu Speedway Club & Robertson Holden International Speedway. Note: Event details subject to change. Always check with the host track for full information and meeting confirmation. Bay of Plenty Speedway Association Inc.